Michael comes back to the beach like a wave with a heart in its mouth, over and over again coughing up words he couldn’t say and things he could not put into words in the first place. Michael feeds things to the sea, first paper, then pen, sacrifice after sacrifice in the place of his body though it calls him toward the depths like a siren might. Its song is not kind and it is not beautiful but he is taken by it nonetheless. He could never say no to the waves except today when he does. Its chaos echoes loudly within him. His ribs are the boulders against which the waves crash. There is snow even here. It lines the browning salt grass and tumbles in sheets down the dunes to its edge where high tide marked it unnecessary only hours before. Michael is ankle deep in wet sand and saltwater and the chill of it makes him dizzy. He thinks, today of all days, he is useless. In the end it was not Michael that was called to war, not Michael that was sent away to gather information, not Michael whose name was called to stand among his people (his people, he thinks with some softer version of bitterness, blurred at the edges and faded to gray) and pledge his heart and soul to danger, to country, to Isra. He hadn’t known that he would find her here and may not have come if he had. He is too alive right now, singing with every centimeter of his body. 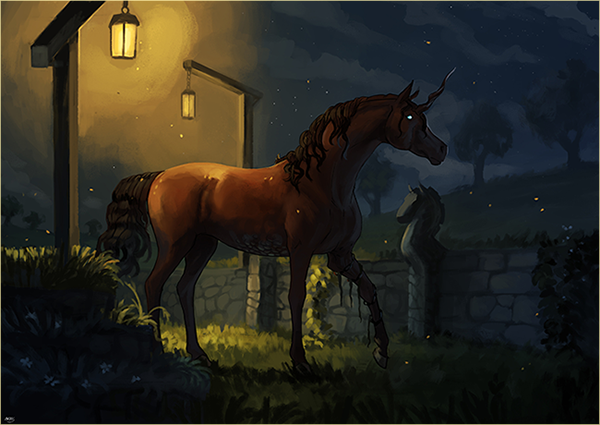 Michael’s fetlocks have long gone numb but still, he stands, searching the white crests of the waves for—he doesn’t know. He is struck again by just how often he doesn’t know. @Isra here is a starter that kind of got away from me? 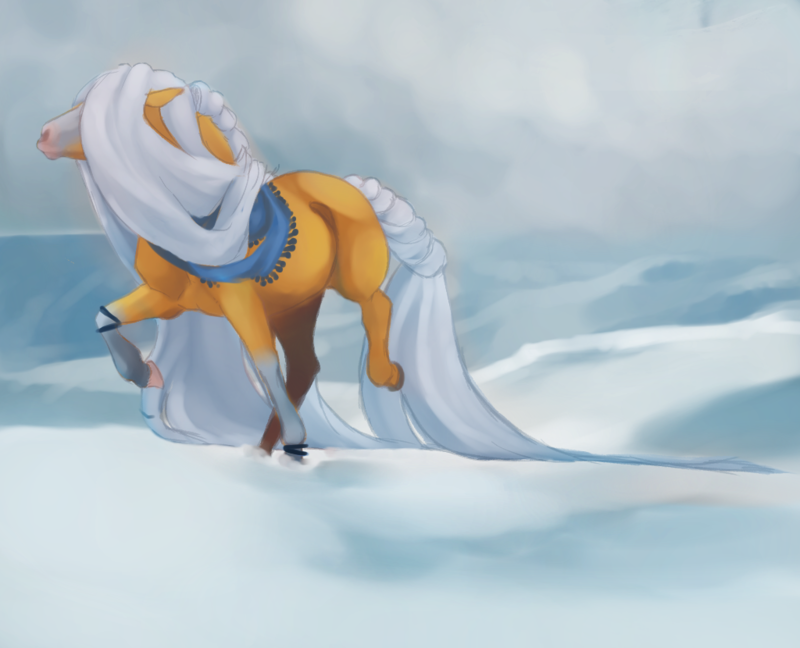 Isra watches him with snow and dead grasses dancing around her hooves like pale ghosts of things that have forgotten how to live. Each changes to something else the moment it touches her skin, but everything she creates is still dead, dead, dead. All her magic kisses bring with them only a dead beauty glimmering in the gloaming winter-light. Every inch of her trembles to join him. Every inch of her tongue is full of words and her teeth are throbbing behind her black lips. She wants to tell him that she's sorry, that she understands, that she's happy. She wants to tell him that she's happy to dash herself against the shoreline of war and turn each of her bones to weapons. Isra is happy that war has called her, that she might battle onward towards death so that all the ones she loves might stay bright like sea-grass in the summer. She wants to tell him that she misses him. She wants to tell him she's coming home. But it's only silence that flows like dead music from her when she walks through the snow and mud towards Michael. Her magic is the first to reach him, turning all the wet mud around his ankles to dandelion seeds. The waves wash away the wishes with each pull of the tide. Isra makes more and more of them hoping that he will send at least one wish out to the sea where Fable is waiting to find it. Isra touches his shoulder with her nose, and her teeth are still throbbing against the force of all the words banging against them. A few escape in the cracks between her teeth and she smiles against his skin. “Fable misses you.” Her smile feels as brittle as her words, brittle and full of half-truths she's not brave enough to say. With his mouth full of dandelion seeds Fable rises from the white surf of a far-off wave. His throat hums and vibrates. Wordlessly he gives life to all the broken things rattling around inside of his unicorn. The earth drags in a breath that burns its throat. A hush falls over the coast. Michael's mind is a mess of disjointed and arrhythmic poetry, some thought that went skittering across the waves the second it entered his head. He has not felt chaos like this in a while but he could walk its streets if he wanted, darting through alleys and nodding at every stray cat on the sidewalks. Sometimes all he is is chaos. Sometimes Michael is not himself but what he used to be, a sturdy rock against which the waves break. More often he is the waves, breaking. the breath in his lungs, the breath that the earth had been holding, pushed out. Maybe the magic that used to pulse from him in rings of things unthinkable is what plants him firmly in the sovereign's plane of dandelions. He recalls he could never do something so tangible but each second in her presence is a dreamscape born over and over again and he thinks that if there is nothing left in this world that he knows the name of he does know, intimately, what it is like to live in someone else's dream. Michael goes cold under her touch. "Me too," he almost whispers. There in the distance is the dragon's head, the dragon's neck, and Michael cannot see that he too hums with this energy like gnashing teeth and a night with no stars. 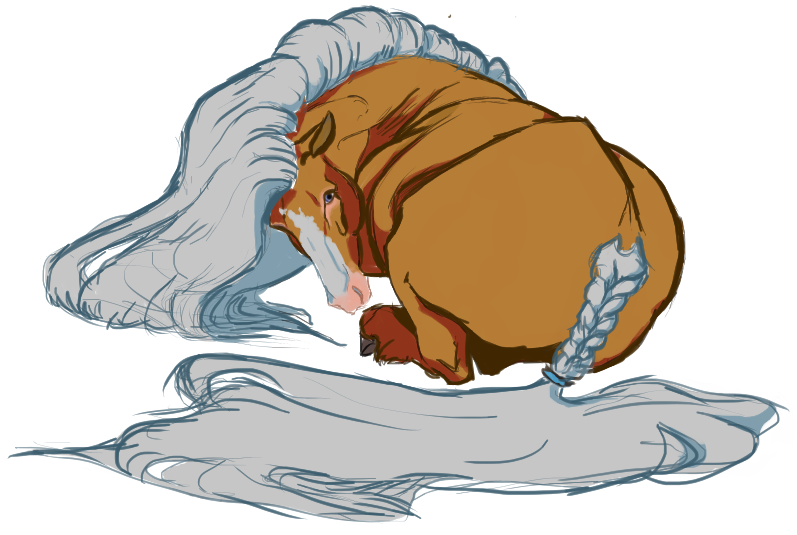 The golden horse plucks a dandelion from the wet sheet of his mane and holds it up to the light. "Isra," he begins before blowing the seeds into the gray afternoon sky, "are you okay?" Now, finally, he turns to look at her, a sizzling pool, a geyser bubbling just under the water's surface. It is these times that Michael seems callous, lost to some far away time that has no connection to their present and certainly not their future. He is thinking of the dragon in the surf. He is thinking of Isra's city on the hill. He is thinking of her and there is a rock in his stomach because he does not know her well at all but he worries, still. "What are you going to do?" A hundred dandelion wishes are flying free in that space behind her eyes. They are flying fast and free in a tornado of hope and a tidal of worry. Each seed is dark as soot and soon it feels like a wasteland of black dust flecks is forming fast in her mind. It's snowing black thoughts in her mind. But then she watches him blow a seed out to the sea (to Fable) and each of her dead snowflake thoughts turns to rain. Looking at him feels like holding the rain, cool and impossible against her dry lips. Isra is so tired of tasting sand and dust. The brine tastes almost holy between them when she moves closer and rests her cheek against his neck. Everything about her feels like a stone in the wet and seeded sand. Everything about her feels like it's sinking. Into war, into exhaustion, into sorrow she's sinking like a boulder in the deep sea. She wants to tell him everything. She wants to tell him that she understands the need to walk and walk on until the world is nothing but a blur of a dreamscape. Instead what she says is, “I'm ok”, and the lie burns like salt in a fresh wound. Isra's not ok, she's bits of flesh broken down and stitched together. She's a girl who wants to cry at the same time she wants to burn the world down. All of her is broken and sharp and she's bleeding out deep beneath her skin where the world cannot see. She's bleeding violence and empathy. And she knows that in the end there will be nothing left of the unicorn she was, nothing left of the slave who wanted to die. Isra has no idea what will be left of her in the end and it terrifies her. But she's telling herself, do not tell him, don't say a word. The curl of her horn sings in the ocean wind and she hope he'll listen to that song instead of the off-beat hum of her weak heart. Below that whispering wind-song she pulls her cheek from his neck and her eyes are still saying do not tell him. Her eyes shine like snow above the sea, cold and made of salt. “I'm going to kill Raum.” Each of her teeth feels like a blade behind her brittle lips. She feels like a blade digging a grave out of the dirt, shoveling away pile after pile of brown loam and pale worms. “I'm going to free Solterra from him.” Fable roars in the waves and starts to make his way to the shore. The sound of his slow rage almost drowns all her words but free. Isra almost smiles and she hopes that her white-blade teeth are still hiding the words say nothing. Michael is his own apocalypse and if he dies each morning he is remaking himself each day, hoping to resurrect into something that is not made so ugly by pain or cavernous in the face of this mounting desire to be unmade; he is empty and he is dark, a shack with no electricity, a shack at the bottom of the ocean. I’m ok, Isra breathes, and Michael almost laughs. “I’m ok” is not one long scream punctuated by wet sobs. “I’m ok” does not smile the way Michael smiles, wolfish and desperate with its tongue pressed tight against the back of its teeth. “I’m ok” is not a large wound trying to cauterize itself on the fires of vengeance. Sorry, Isra, he knows. Consider the silent gulls, watching them from the cliffsides and the mountainous sea rocks; they mourn. Consider the dandelions bunching still at his ankles; they mourn. Consider her skin that crackles with unspoken spells and the sizzling of magic run wild; it mourns. Consider the heavy silence that falls between them, Michael’s expression is grim and off in the distance Fable is churning like the ocean churns but twice as loud. He echoes the things that she doesn’t say and if Michael hadn’t known that Isra is an exposed bone, a caustic and ragged and violent ghost sweeping through Novus like a thing possessed, surely he has seen it now. And she will. Michael is not a creature prone to doubt in the first place but he has seen her peel back reality and remake it without even thinking. If he has been sure of any one thing in his life it is that Isra can bring to ruin any single thing that she wants. Even the ghost that walks through their shadows and haunts the attics of the hearts. He nods, maybe to reassure himself. The roar of a dragon rings loud in his ears. And, unexpectedly–“Isra, please–”what? He doesn’t know. (He does know, but it is one of the innumerable things that they do not say, that he does not say in specific, either because they cannot or they do not want to, or both. Please come home. Please stop becoming a weapon and wrecking yourself on the rocks out at sea. Please do literally anything but what you are doing). The words,I'm sorry, are a litany beating out a song against her ribs. Each word is an ache in that hollow behind her gaze where a million things are begging to be given life from the fires of all the things she feels. The seeded shore becomes littered not with lost wishes but with hard stones, gray and round. They clack against her hooves like dull teeth each time a wave crashes against her. Isra doesn't try to turn them back to wishes and seeds, she only feels the beat of stone against her bones and welcomes it. Each flake of rust on her chain turns to a smear of ore, as if she's using that black metal snake to remind herself that she needs to be dark now, dark as the night sky that swallows up the sun against a twilight sky. And still those words, I'm sorry, are bellowing in her like an organ through a steeple. Michael says, please, and there is something in her that wants to answer all the questions can see crawling across his skin like itches. Isra wants to answer, anything. She wants to beg the questions from him like a lost god begs for each ounce of worship. “Yes,” The word falls from her like snow that's both a declaration of winter and a promise of spring's arrival. She doesn't know what else to tell him, for all the other words like, I'm sorry, and anything are still strapped in that ivory shield of teeth. They want out but her lungs are brittle things filled with desert sand and they don't know how to breath in brine and breathe out wonder anymore. Was her magic ever sweet? Was the brine ever not sharp and gritty on her lips? Was the sea ever anything but a dark beast looming before her whispering come home, come home? Was there ever not a litany of sorrow and rage not rattling her bones like a cage? She doesn't touch him again, but she wants too. Instead she only watches him with everything conflicting swirling in her eyes like a disaster wrought from heaven. Fable joins them, a behemoth risen from that black sea that wants Isra back. He lowers his nose towards Michael who is still making his unicorn feel too many things. He's gentle despite the anger and the worry running through him like Isra's magic is running hot through her. Isra wonders which of them is more gentle. Once she knew, but now like everything else, she's forgotten.